Supreme quality from start to finish. Our ER clamping nuts convince with a high transferable torque and an excellent balancing quality. 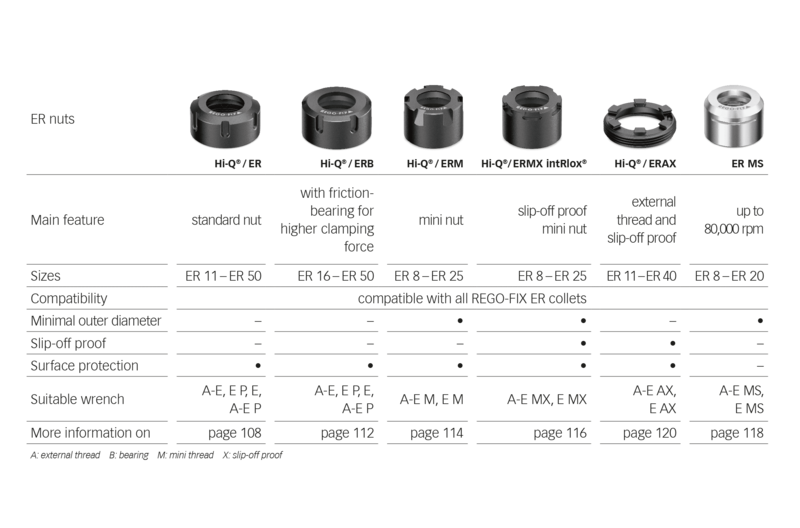 Our wide product range offers the perfect nut for every application. Hi-Q / ER clamping nuts with corrosion-resistant surface are the standard nuts on all ER colletholders. Hi-Q / ERC clamping nuts for coolant through tools. Designed for application with DS/ER and KS/ER. RCR/ER reCool for use with driven tools. Low-cost retrofitting to internal cooling. Hi-Q / ERB clamping nuts with friction-bearing for higher clamping force. Hi-Q / ERBC friction-bearing clamping nuts for coolant through tools. Hi-Q/ ERAX clamping nuts with external thread and slip-off proof profile. Hi-Q/ ERAXC external thread clamping nuts for coolant through tools. Hi-Q / ERMX clamping nuts with minimal external diameter and slip-off proof profile. Hi-Q / ERMXC slip-off proof mini clamping nuts for coolant through tools. RCR/ERM reCool for use with driven tools. Low-cost retrofitting to internal cooling. RCS/ERMX reCool to use with static tooling systems. Low-cost retrofitting to internal cooling. ER MS clamping nuts for up to 80,000 rpm. Hi-Q / ERM clamping nuts with minimal external diameter for limited machining space. Hi-Q/ ERMC mini clamping nuts for coolant through tools.